In Québec and New England, it’s maple syrup time. 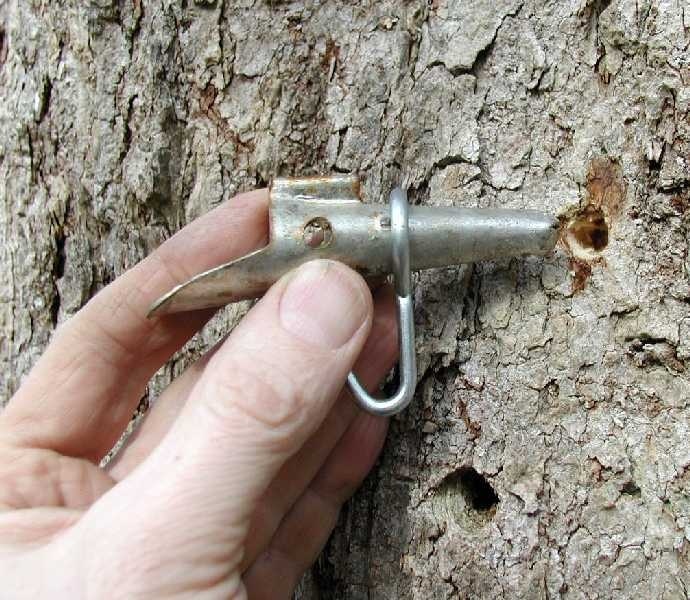 The maple syrup business is a multi billion dollar business and it operates during a narrow 6-8 week window when the sap of maple trees starts flowing and can be harvested. Tapping season requires daytime temperatures above freezing with nights below freezing. 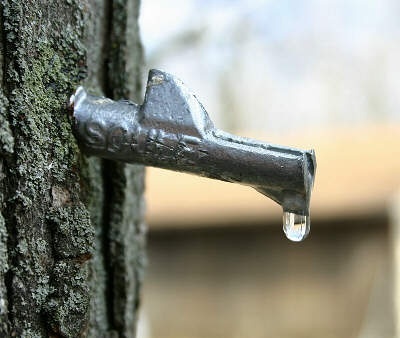 40 to 50 gallons of sap are needed to produce 1 gallon of syrup! No wonder it is on the pricey side! This year the brutal winter has delayed the season by about 2 weeks. 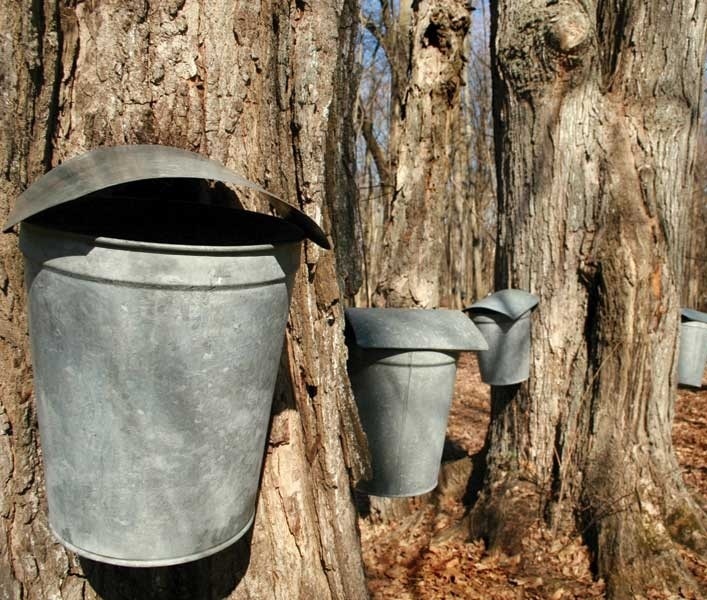 Although sugar shacks still display the old fashioned, traditional sap bucket hanging from a tap in the tree, modern methods have replaced this nostalgic harvesting. 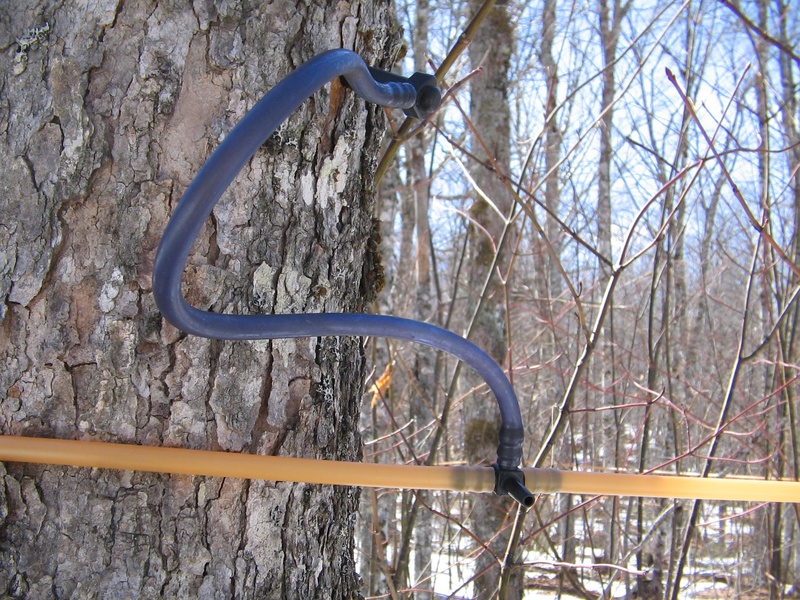 Plastic tubing connected to a vaccum pump now harvests the sap via reverse osmosis and delivers it directly to the sugar house for the boiling process. This method extracts about 2 times as much sap as the traditional method. Maple syrup is a healthy sweetener. It contains 20 health-beneficial compounds including iron, zinc, manganese, potassium, thiamine, calcium as well as anti oxidants such as polyphenols which are thought to fight cancer. Boost your morning oatmeal with blueberries and a splash of maple syrup for a big dose of antioxidants. Maple syrup contains 52 calories per tablespoon vs 64 calories in honey. One tablespoon will get you 1/3 your daily dose of manganese, a mineral necessary to stave off bone loss and ease PMS symptoms(Redbook). 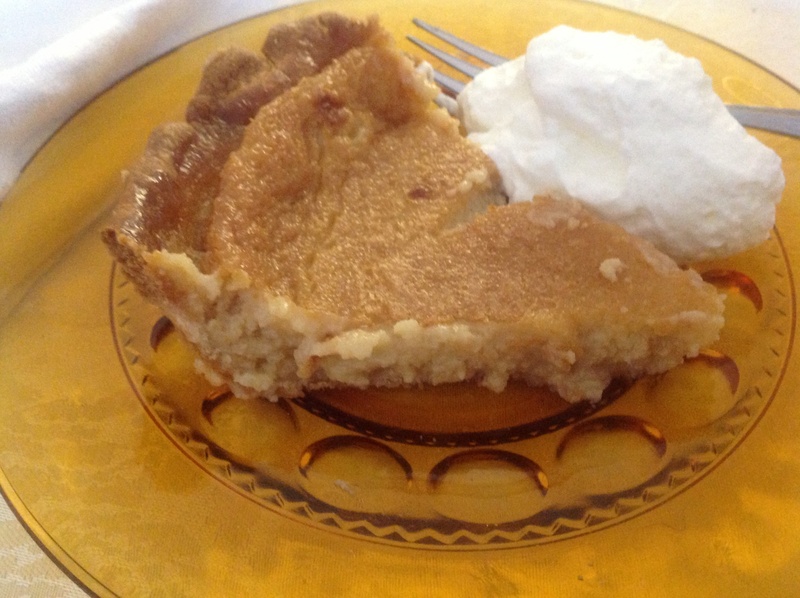 On a spring-break stop to visit my mother who is wintering in sunny Florida, she was very excited to make us a maple syrup pie, a new addition to her répertoire. If you recall an earlier post featuring my mom, you will know she is an outstanding cook. Some of the commentary heard around her table were: “grandmaman, never make any other kind of pie!”; “OMG, this is so good!”; “Mom, blog about this so I can comment that you are not the best cook in the family!” With only 3 ingredients in the pie filling, this recipe, is, well, easy as pie! Enjoy! Directions: Preheat oven to 350FWisk the eggs, add the condensed milk and maple syrup and mix well. Pour into the unbaked pie crust. Bake at 350F for 40 minutes, until center is set but still slightly jiggly. 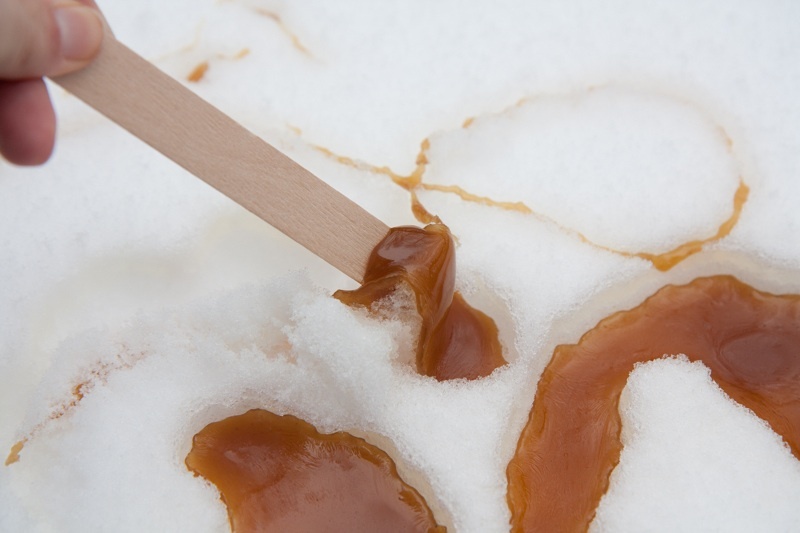 This entry was posted in Recipes and tagged cabane a sucre, health benefits of maple syrup, Maple sugar, maple syrup harvest, maple syrup pie, maple syrup. 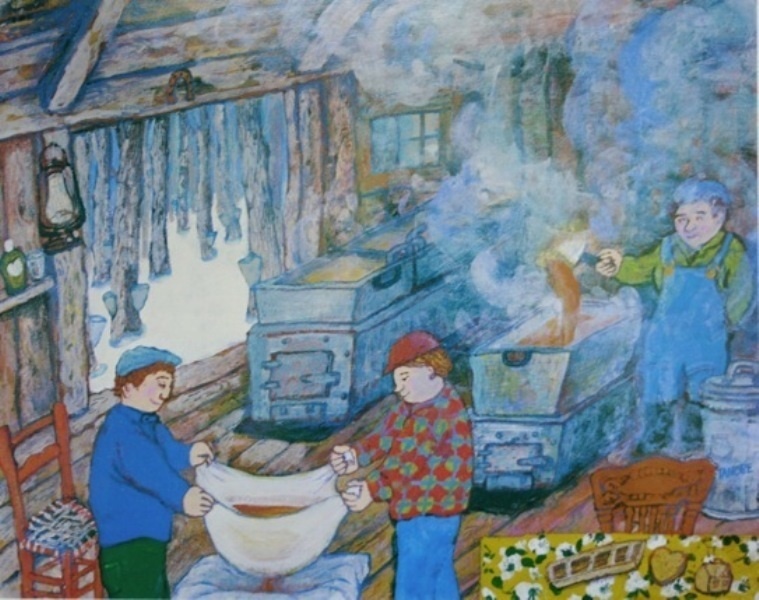 Maple taffy, Miyuki Tanobe, sugar shack by Johanne Lamarche. Bookmark the permalink. Must try that. Looks so yummy. Maybe when you’re w Dana! She wanted to make sugar pie. This was better ! excellent pie; I have tasted it as my mother baked it .AWESOME! !